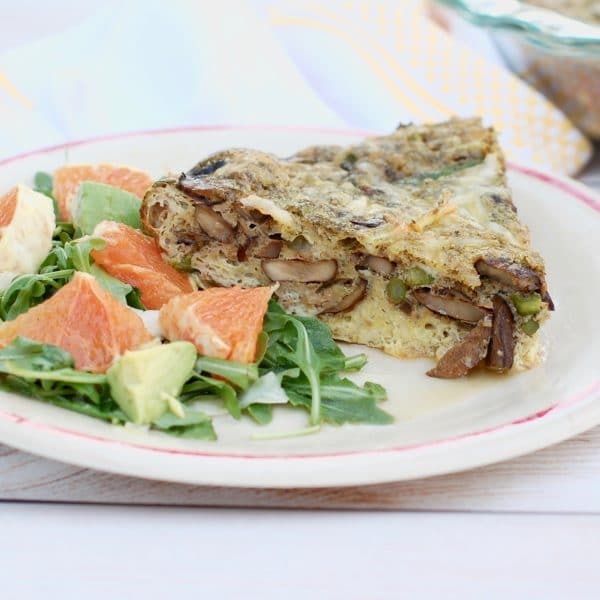 Savor the flavors of spring and summer with this Mushroom Asparagus Pesto Frittata. Perfect for a quick and easy weeknight dinner or a relaxing weekend brunch. Asparagus season is pretty much over, but you may still find a few good bunches of spears in the supermarket. If you do, I have a great weeknight or weekend brunch recipe for you to make. This Mushroom Asparagus Pesto Frittata is light enough for the hot summer days we’re having, yet it’s also full of flavor thanks to those umami-rich mushrooms and Parmesan cheese. A few years back, I made a tomato-basil pesto frittata, which was inspired by a recipe in Everyday Food (a magazine that, sadly, no longer exists). Clearly that recipe needs a photo update (don’t judge how delicious it is by the horrible pics! ), but I remember thinking pesto mixed into frittata is super delicious. So when I had an open container of store-bought pesto at I didn’t want to go to waste (have you heard about the #EndFoodWaste campaign?! ), I thought I have to make another pesto frittata. 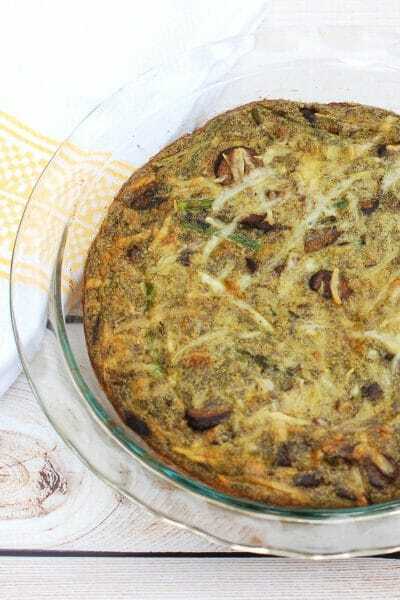 With asparagus season almost over, I decided to make this asparagus pesto frittata, and of course I needed to add mushrooms, because what egg dish is complete without them?! While I used the Trader Joe’s prepared pesto, if you’re overflowing with basil from your garden or your local CSA, feel free to make your own. You can also make your own pesto using any other leafy green you may have on hand like arugula or spinach. You can check out my Mushroom Onion Pesto Pizza and my Farinata with Tomato, Mozzarella, and Pesto Drizzle for some homemade pesto inspiration (if you’re looking for a nut-free version, go for the former). When it comes to making frittatas, I do have a few flavor-boosting tricks up my sleeve. 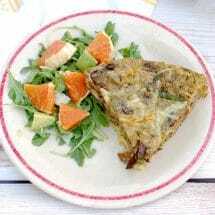 Be sure to check out my previous Baked Mushroom Leek Frittata to find out what they are. Once you’ve done that, it’s time to get to this recipe! Preheat oven to 375 degrees F. Spray 9-inch pie dish with cooking spray and set aside. Heat olive oil in a large skillet over medium-high heat. Add onions and sauté 3 minutes, until starting to brown. Add mushrooms and sauté 6 to 7 minutes until softened and most of the water has evaporated. Add 1 to 2 tablespoons water to deglaze the pan. Add asparagus and sauté stirring continuously, 2 to 3 minutes until bright green and slightly tender. (Thicker asparagus may need to be cooked longer and pan may need to be deglazed again.) Add 1/4 teaspoon salt and pepper to taste. Remove from heat. In a medium bowl, whisk together eggs and half and half. Stir in pesto, remaining ¼ tsp salt, and pepper, to taste. Sprinkle 1/2 cup of shredded Parmesan in bottom of pie dish and top with vegetable mixture spread in an even layer. Pour egg and pesto mixture on top and sprinkle with remaining ¼ cup cheese. Bake frittata for 30 minutes until top is puffed and golden brown. You can use evaporated skim milk or low-fat milk in place of half & half if preferred. Are you still finding asparagus at the market? If so, what are you making with it? This looks SO good Jessica! But, now you have me feeling sad that asparagus season is over!!! I make an asparagus quiche that is yummy, but I love your frittata idea, especially with the pesto and mushrooms. Can’t wait to make this! Thanks so much EA! I know, it’s sad how short the asparagus season is. You may still be able to get some good ones for a wee bit longer. Hope you do so you can try my frittata recipe out! This looks amazing! We just picked the last of the asparagus in the garden and this recipe is prefect, thanks! Thanks Emily! Lucky girl you have some fresh from the garden. Hope you enjoy! Thanks so much Jodi! The side salad is one of my go tos all winter into spring. I’ll be posting that recipe next fall!! Good luck with the asparagus if you do it! Thanks so much ladies!! I love frittatas! Yay for umami! I love playing around with different frittata ingredient combinations and you’ve definitely got a winner here! Thanks so much Sonali! I love having meals that I can easily change up based on what’s in season! I love mushrooms and asparagus together. So yummy! Agreed! So quick and easy to put together and always a crowd pleaser! Thanks Maria! 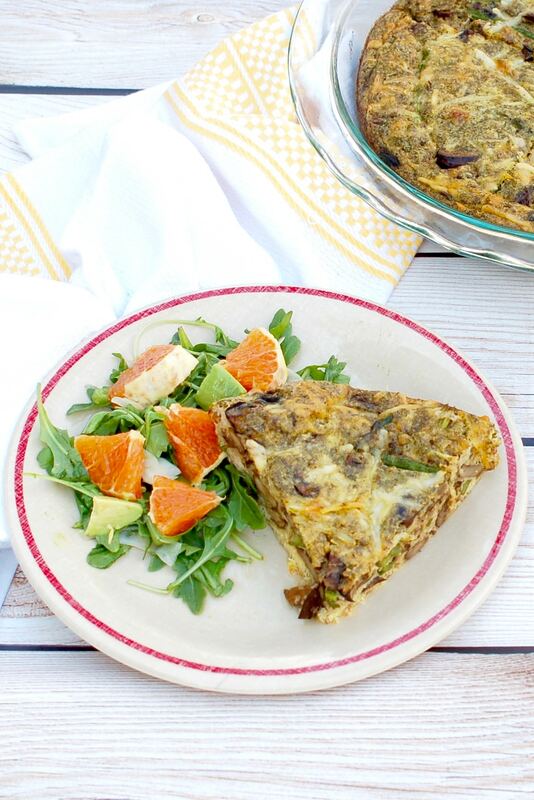 This frittata looks super delicious! Love all the veggies and the pesto too! Have to check out your flavor-boosting tricks now! Thanks Taylor! Hope you enjoy and that those tricks come in handy! A great idea for brunch! #EndFoodWaste sounds like the best motto to live by. Thanks Cindy! I have really taken to the end food waste campaign! Frittatas are the best and this one sounds so great Jessica! So glad to hear you’re a fan of frittatas too, Sara! Thank you! l love the mushroom and asparagus combo and that this is so simple and versatile. If only I had asparagus left! I love love love mushrooms! This sounds amazing! Me too Kristina! Hope you enjoy! I love veggie fritatta and often making them for brunch on the weekends. Love all the seasonal produce here and I would never have thought to put pesto with my eggs. Can’t wait to try this!! Thanks so much Rebecca! Can’t wait for you to try it. I love the versatility of frittatas too! Agreed! Thanks so much Abbey! Hope you enjoy! 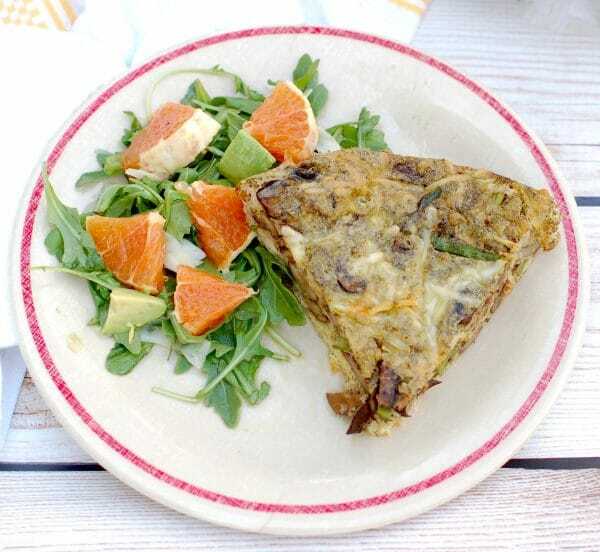 yes…this sounds like something i do every friday – try to clean out the fridge…frittata always works! This sounds so perfect for spring with the asparagus! I love making frittatas and quiches on the weekends, so this will probably go down in my kitchen on Sunday! Thanks Chrissy! Hope you enjoy it. It’s really a great meal prep meal – you can have it for breakfast, lunch, or dinner! I have never added asparagus or pesto to my frittatas before! But the idea is making my mouth water!! I’m so glad I’ve inspired you to try something new Esther! Please do let me know if you give it a go!! You had my heart at pesto! This is definitely right up my alley! Aw so happy to hear that Carmy! Hope you enjoy! Haha…that’s too funny Shelby! So glad you know the deliciousness of this combo already! I am such a sucker for frittatas! I can eat them for breakfast, lunch and dinner! And this one looks right up my alley! Same here! Just had some leftover frittata for lunch today! I just had a frittata for breakfast this morning! I love the everything you’ve got going on with this one! Thanks Linda! I had some for lunch today! Mine didn’t look this beautiful — but this was a lunch on the weekend!! Great minds think alike. I confess, herbs added to mine of course ~ fresh basil, thyme and rosemary. I used 2% milk but you know.. I think this could easily become a dairy free option. Such a perfect combination of flavours! Long live the Frittata! !